Every August the city of Edinburgh is put in the spotlight due to the festival of comedy, music and theatre that’s held there. But lurking beneath this surface of joviality and hedonism, there is a much darker, more disturbing side to this city that most festival-goers don’t see. It’s a sinister and murky history littered with murder, grave robbing, executions and witchery . . . and it happens to be a wickedly exhilarating backdrop for an exceptional book we have out this month. From Brian Ruckley, author of the critically acclaimed Godless World trilogy, comes The Edinburgh Dead (UK | US | ANZ), a darkly thrilling tale of murder, body-snatching and black magic. 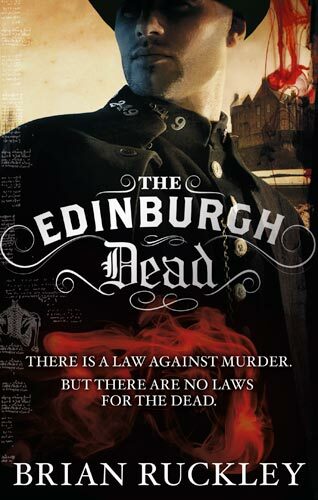 And it’s woven throughout with real-life characters and happenings from the shocking, all-too real history of the city. The book is set in a period when medical scientists were experimenting the gruesome practice of dissection for the first time. In the operating theatres of Edinburgh, corpses were being sliced apart in front of the eyes of horrified and entranced spectators. The bodies used were supposedly obtained by honourable means. But those who know their Scottish history know that a certain pair called William Burke and William Hare were looking to make a tidy profit off these recent advancements in anatomical science. They realised how much a corpse could fetch on the black market at the time. However, they weren’t quite prepared to wait for their victims to die of natural causes before selling on their bodies . . . When Brian turned his eternally eloquent hand to this dark episode from history, and elaborated the facts with a gripping fantastical twist, I was amazed at the results. Drenched in atmosphere, heart-stoppingly suspenseful and thoroughly transfixing – I urge you to read this excerpt to see just what’s in store for you. In the starkly-lit operating theatres of the city, grisly experiments are being carried out on corpses in the name of medical science. But elsewhere, there are those experimenting with more sinister forces. Amongst the crowded, sprawling tenements of the labyrinthine Old Town, a body is found, its neck torn to pieces. Charged with investigating the murder is Adam Quire, Officer of the Edinburgh Police. The trail will lead him into the deepest reaches of the city’s criminal underclass, and to the highest echelons of the filthy rich. Soon Quire will discover that a darkness is crawling through this city of enlightenment – and no one is safe from its corruption.